The 777 has three fuel tanks (simplified version). A large Center Tank and two smaller main tanks (one in each wing). When refueling, the Mains are filled first, then fuel is pumped into the Center tank (simplified version) until either you have enough fuel, or it’s full. There are two center tank fuel pumps and their job is to … pump fuel out of the center tank to the engines. With me so far? Note – as pointed out (below), in fact the 777 Refuelling System doesn’t wait for full mains before pumping fuel into the center. The point however is that for dispatch purposes – the mains are supposed to be full before you start accepting fuel in the center tank. 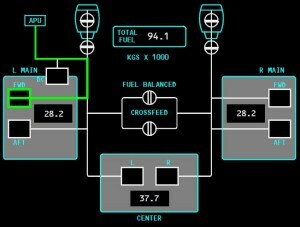 A total fuel figure is programmed by the refuelling into the refuelling panel, and the software schedules fuel into all the tanks to maintain a CoG range, as well as expedite the refuelling process. So far so good, except that as you get down to the bottom of the tank, the two Center Tank Fuel pumps can’t quite get at all the fuel. So they’re switched off with just over 1 ton of fuel to go. From this point the Main Tanks take over, each one feeding the onside engine, until you land. Or run out of fuel – but for the most part, land. But what about the fuel left in the Center tank – typically about 1.3 tons? That’s the job of the Center Tank Fuel Scavenge System. Once sufficient fuel has been used from the Mains (actually once LOTS of fuel has been used out of the Mains) the Scavenge system kicks in, pumping that 1.3 tons into the Main tanks where it’s used by the engines. That’s simple enough. I might add that none of the scavenge system is visible on the flight deck, apart from the fact that the 1.3 tons left in the center tank once you turn the pumps off magically disappears later on in flight. At least, that’s what should happen. 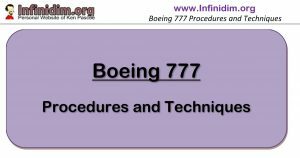 Boeing have confirmed that intermittent failures of the Fuel Scavenge System are caused by the collection of ice in the scavenging system in flight. The result is the loss of the system and the associated FUEL SCAVENGE SYS alert message. All pretty straight forward. Of course the failure of the fuel scavenge system potentially results in the inability to access up to 1.3 tons of centre tank fuel, which may well impact on your ability to continue onto destination, but I digress. Centre Tank Fuel Available – Yes / No? 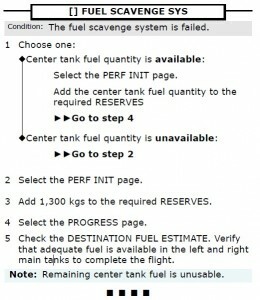 The answer to this is patently clear to the Thinking Pilot (how many times have we told you not to do that …) – of course Centre Tank Fuel is unavailable – you can’t get it out of the centre tank without the Scavenge System – and it’s failed. So you click No and you’re on your merry way. Center Tank Fuel Indication is Available – Yes / No? You can verify this by taking an overview of the checklist. 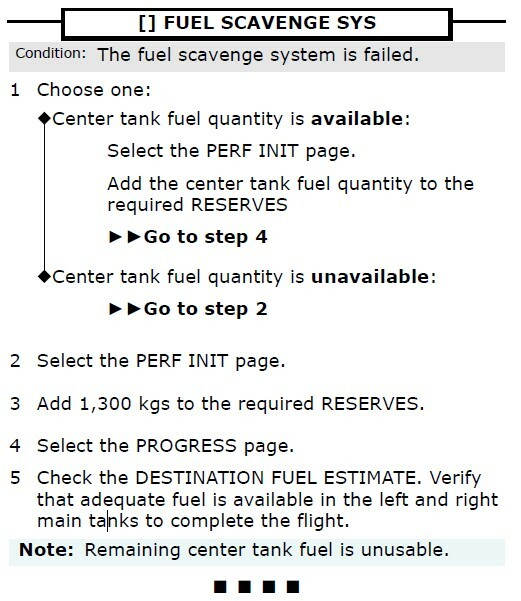 If you can tell how much (now unavailable) fuel is in the centre, the checklist directs you to add this value to the FMC Reserves, giving you an earlier indication of INSUFFICIENT FUEL and a smaller FMC HOLD AVAIL time when holding. That’s a sensible, conservative use of the available information. 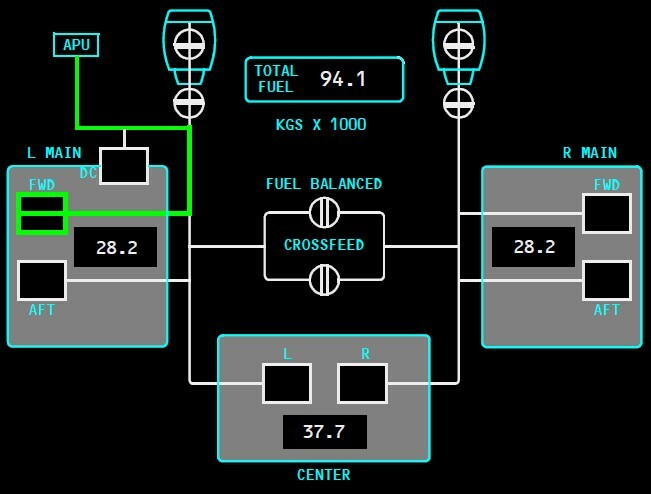 If you can’t tell how much fuel was in the centre, the checklist assumes the worst and requires the crew to increase the Reserves figure by the most that could be contained in the center tank at this point – 1300 kgs. It’s worth noting that our experience on the line is that the fuel often becomes available on descent as the ice melts. Despite my attempt at humor (above), the thinking pilot walks a fine line between reacting and following a checklist – while maintaining the big picture of what the checklist is trying to achieve and why. Often we are taught not to second guess a checklist – for example turning on hydraulic pumps to a system that has no fluid (“Just do it – don’t get creative.“) While this is one of those cases where being aware of the nature of the problem helps interpret correctly a poorly worded checklist question – the better pilot maintains the big picture of the nature of any problem and keeps in mind the how and why of what a NNM checklist is trying to achieve.